Yahoo has rejected a takeover bid worth more than $40bn (£20.5bn) from software giant Microsoft, saying it is too low. Yahoo said the offer "substantially undervalues" the company and is not in shareholders' interests. Microsoft's offer was worth $31 a share, 62% above the level at which Yahoo stocks were trading when the offer was made on 1 February. A merged Microsoft and Yahoo would be one of the biggest technology firms, and would rival industry leader Google. Microsoft said that Yahoo's rejection of its initial offer was "unfortunate," but that it still had belief in the merits of its proposal which it felt was "full and fair." As it rejected the Microsoft offer, Yahoo said that the deal undervalued its brand, audience, investments in advertising platforms and future growth prospects, free cash flow and earnings potential. The company said that its board of directors was continually evaluating all of its strategic options. "Right now they are haggling," said technology analyst Rob Enderle. "Yahoo is not saying no at any price. They are saying the Microsoft offer is not strong enough." he added. A source quoted by the Wall Street Journal said that Yahoo's board would be unlikely to consider anything below $40 per share. A $40 a share offer would be a 109% premium to the $19.18 closing price of Yahoo's shares the day before the original offer was announced. Yahoo's shares have not traded above $40 for two years. By the close of Monday's trading in New York, Microsoft slipped slightly while Yahoo rose 2.3% to $29.87. Analysts say Microsoft is likely to come up with an improved offer. "This is so important from Microsoft's perspective there's a very good chance there will be more money on the table," said Ian Maude, from Enders Analysis. "The strategic logic is in the online ads market. It would make them a must stop destination for any company when considering its advertising plans." A separate report suggests that Yahoo may approach Time Warner's online division AOL in the hope of drumming up an alternative tie-up. 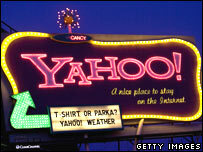 Although Yahoo's shares have fallen sharply in past months, its websites remain among the world's most popular. Microsoft's original offer was worth as much as $44.6bn, but since the deal was announced Microsoft shares have fallen. As half of Microsoft's offer is in cash and half in stock, that has reduced the value of the bid to about $41.8bn.